The disadvantage of regular LED grow light fixtures today is that they are rigid: they have a fixed set of colors. Researchers and growers who want to experiment with variable light recipes, have to install several fixtures with different color combinations. 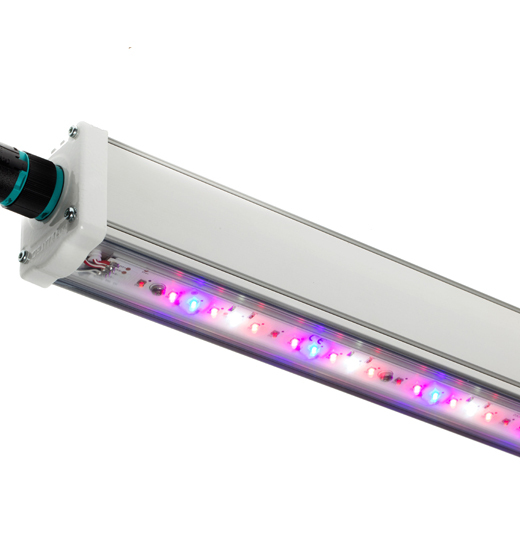 With the HORTILED Multi 4DIM this is no longer needed: it enables researchers and growers to experiment with various color combinations in a single fixture. Growing and research demand flexibility. The HORTILED Multi 4DIM fixture has that flexibility and delivers the highest output. The fixture has been specially developed for research applications in growth chambers, climate controlled containers, tissue cultivation and dimmable experimental set-ups. You create the correct light recipe and light level at any given time, with a minimum amount of fixtures! The Multi 4DIM consists of the highest quality LEDs for white, blue, red and far red. Color, lighting time and light intensity are individually adjustable with the internal four channel driver with DALI lighting protocol. We offer a variety of light management systems to control the Multi 4DIM and let you create the perfect light recipe! HORTILED Multi 4DIM delivers the highest efficiency on the market. Efficiency levels of up to 2.25 μmol/Joule can be achieved, depending on the light spectrum. This makes the HORTILED Multi 4DIM 60% more energy-efficient than fluorescent lighting. The HORTILED Multi 4DIM is available in 120 cm with an 80° radiation pattern. With the Multi 4DIM an intensity range of up to 1200 μmol/m2s is achievable within the 400-800nm horticultural light spectrum. Whether it’s vegetables, fruit, flowers or plants, you create all common light recipes within horticulture and steer plant characteristics such as growth speed, color intensity, leaf development and compactness.